Would you like to display titles below the thumbnails? This is very easy to do in Envira by simply clicking a checkbox. 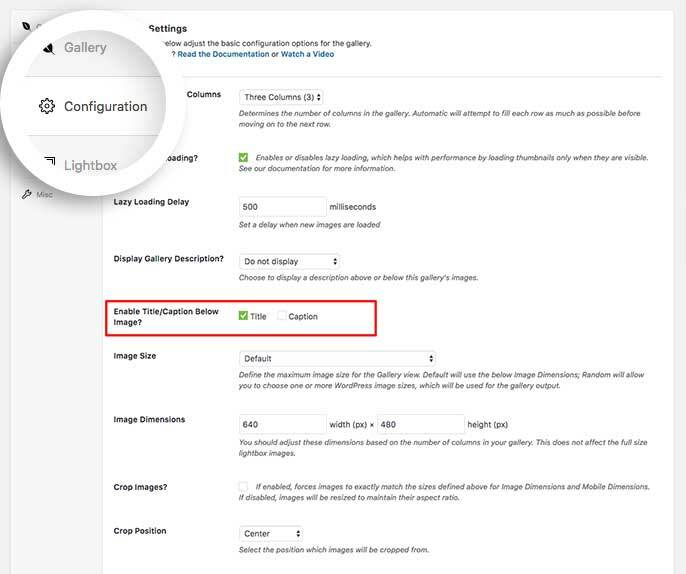 We’ll walk you through the steps on how to display image titles below your gallery images. Can I customize the title appearance? Why isn’t my title showing under the image? To display titles below gallery images, click on the Configuration tab. Look for the Enable Title/Caption? and be sure to click the Title checkbox. Would you like to enable archives for your Envira galleries? Take a look at our tutorial on How to Enable Archives for Standalone Feature. Q: Can I customize the title appearance? A: Absolutely! Using CSS you can change just about anything with Envira titles. Take a look at our article on How to Style Image Title Hover Effects. Q: Why isn’t my title showing under the image? A: If you’re using an Automatic gallery for your Number of Gallery Columns, the title will show at the bottom of the image when you hover over the image.